Cartoons: A New Section to the Site! It must have been a moment of pure madness that convinced me that it would be a good idea to go and start my Christmas shopping on a busy Saturday afternoon in the town. Whilst you set off in good spirits, preparing for the annual unleash of your inner-Santa and contemplating what you can buy for everybody, by the end you have ultimately morphed into Scrooge – you too would be up for banning Christmas if it meant never having to experience the horror that is Saturday afternoon Christmas shopping ever again! The first thing I had to do was pick up some plates from the china shop. These plates had been specially made for my nephews’ christening in a fortnight, with each plate beautifully decorated with their names. I watched the lady wrap them in tissue paper and, considering I was wearing a boot with a broken heel (reason number 45367536 for needing some paid work a.s.a.p! ), debated asking if she could use a couple of extra layers, just in case I tripped up. I didn’t though, possibly because I seem to lack brain cells from time to time. With plates in hand I leave the shop and walk back along the High Street. Town is extremely busy and I’m like a fast-flowing river, meandering rapidly around everybody so that I can get home as soon as possible. Just as I become distracted by a stall selling scarves, Broken-Boot defies me and sends me crashing to the floor, scraping my knees and sending my shopping bags flying. “LOOOOOOOL” jeer a small group of teenagers behind me, their sympathy knowing no bounds. THE PLATES, THE PLATES! I think to myself, and scuttle into the nearest shop to check on their welfare. With a combined cost of around £100, they best not have broken or I’d probably be selling my left hand to Science in exchange for money to refund the replacements as we speak. To my relief, the plates are fine, but the whole episode has left me feeling even less festive than before. I run to a cafe for an emergency caffeine fix to help me recover, and realise that now, all I can do about it is laugh, because it’s far more fun that way. And that’s what the new ‘Cartoons’ section on this website is all about – trying to see the funny in the otherwise undeniably ridiculous or embarrassing. So, please check it out by clicking here or by choosing from the menu above! Thank you! Happy Saturday one and all. A wonderfully uplifting song about the wonder of travel from Seattle band Hey Marseilles. This song just makes me want to sack off all the things that bind us – work, housing, relationships, taxes and just travel for the rest of my life… hey, a girl can dream, right? Enjoy. There’s always Brazilian boys to discover! Men who will hold you with eyes you believe. On the way, I will go. I had just turned ten years old when my parents first took me to the remote shingle peninsula at Dungeness, on the south coast of England between Folkestone and Hastings. It was during the half-term holidays of late October 1995, and we were staying with my Grandma in East Kent for a few days and, whilst there, taking day trips to various different attractions in the area. 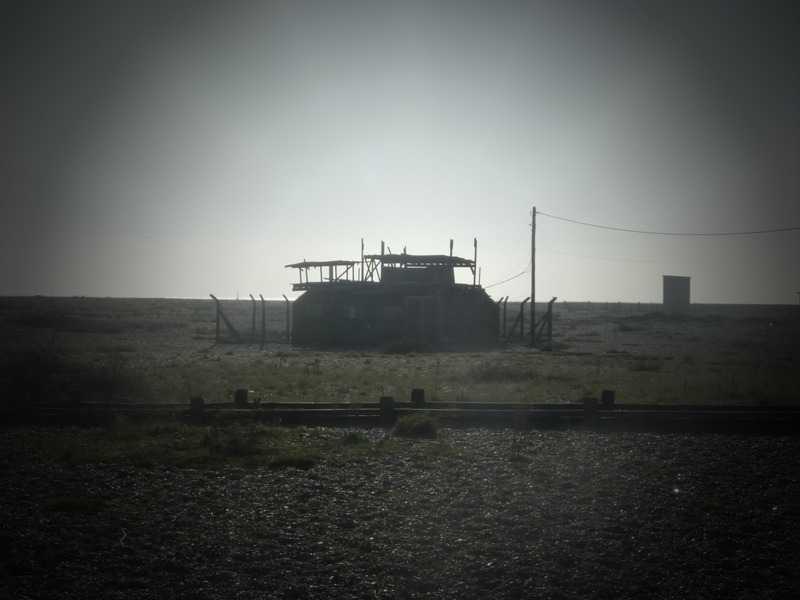 “What’s at Dungeness?” I remember asking my parents, hoping that it was something like it sounded – a creepy ‘dungeon’ of sorts, where I might be able to find the witches and wizards I’d read about in all my childhood books. A good place to visit around Halloween, perhaps? “Who’s Derek Jarman?”, I asked, though I had already concluded that I was probably not going to be at all interested in the answer. Oh er, wowee. The cynicism more commonly attributed to teenage years made a premature appearance that day. I remember the day clearly. My Nana and my 18 year old cousin, Matthew, came with us. It had been a tight squeeze in the car, especially since on the way we had stopped in the nearby village of Tenterden in which Mum had decided it would be a good time to buy a new wicker laundry basket, which was fairly large and spent the rest of the journey in the back of the car, swapping between the laps of Mum and Matthew. We listened to Mike Oldfield’s ‘Tubular Bells II’ and I spent most of the trip chewing my way through a packet of blackcurrant flavour Hubba Bubba. Limited edition, strange taste. It’s safe to say I wasn’t anywhere near as enthused about Dungeness as the rest of my family were. 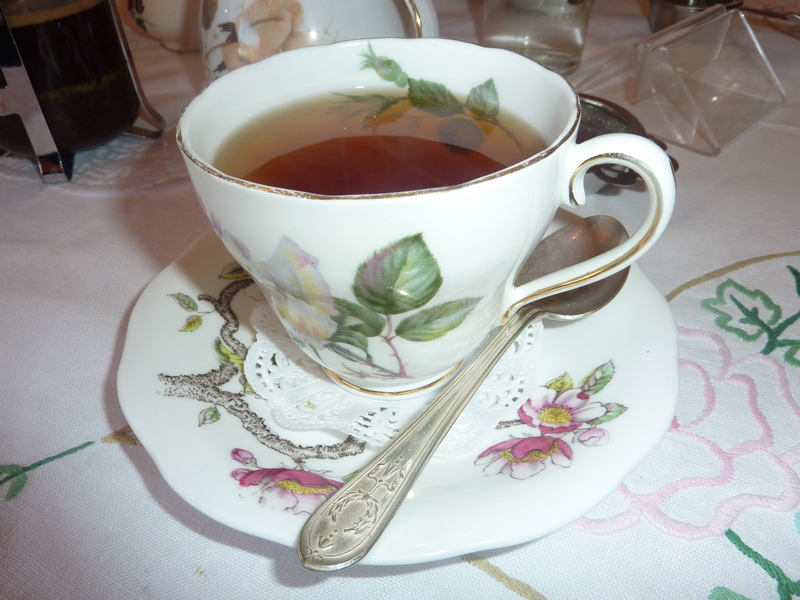 “There aren’t even any sweet shops” I sulked to myself in the back of the car, whilst everybody else crept around the cottage, peering into the windows and admiring the garden. My parents hadn’t been lying when they said there wasn’t much at Dungeness. Sixteen years on, there still isn’t, but growing older I realised that that was entirely the appeal. We went back on average once every two years. Coming all the way from Watford, we’d usually eat lunch in the Britannia Inn restaurant there. Best scampi and chips I’ve ever had… and they always provided you with plenty of tartare sauce. It’s hard to make a whole space of nothing sound attractive to anyone who has never been there. It’s not pretty, it’s not vibrant and colourful. It’s desolate and barren. Black. But, when you’re there, you feel a connection with the Earth that cannot be found in many other places. 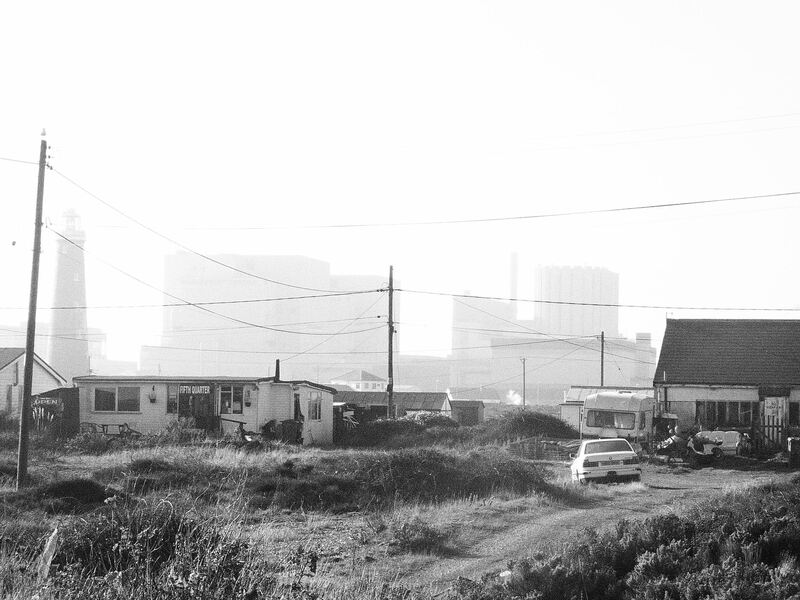 Dungeness, with it’s black power station looming over the peninsula, acres of shingle, a few beach-houses and bewildering iron sculptures is a haven for the creative or for those who just want to have a bit of respite from the rest of the world for an hour or so. It’s safe to say the place attracts more visitors than there are visitor-attractions, because somehow the car-park of the Britannia is always full and Channel 4 even used the backdrop of the pylons in one of their idents a few years ago. For somewhere that has so little, it seems to give so much. Indeed, it’s a fabulous place, but only if you have an imagination. We leave Appledore, myself having taken lots of photos, and continue on to Dungeness. It’s my first time going to Dungeness with a decent camera in tow and I revel in using the ‘Pin-Hole’ and ‘Film Grain’ special effects whilst photographing the random relics that make this such a special place. 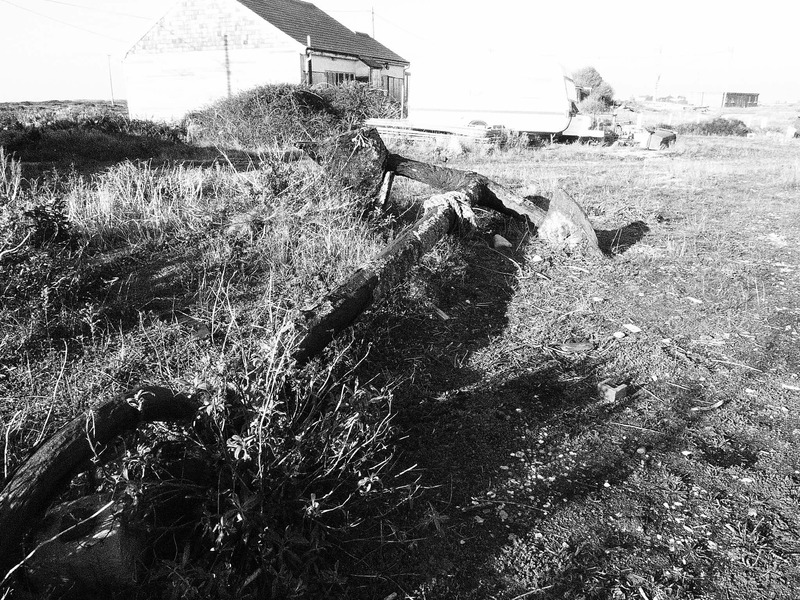 As usual, the Britannia Inn is busy and the barren, shingle beach-front is dotted with various weathered, iron-shaped relics sculpted by artists whom all saw something special in Dungeness. I decide to head towards what looks like, but isn’t, a wooden abseiling wall about 300 meters away. It looks somewhat out of place in such a flat, empty mass of stones. 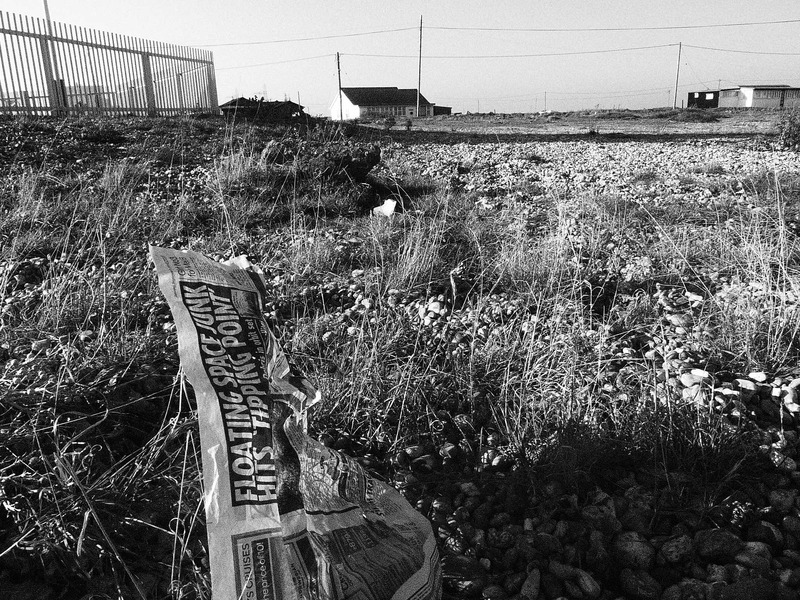 Along the way I notice a sole page of newspaper flapping about in the coastal breeze. It’s caught on a rock. I’m captivated by the headline, “Floating Space Junk Hits Tipping Point”. Even more intriguing is the date on the paper, ‘September 3rd 2011′. It is over two months old yet still looks so recent, untouched by rain, it’s print as clear as when it was hot off the press. I wonder if somebody placed it there on purpose for the benefit of an artistic photo, one I take advantage of as I crouch down with my camera and try and get a shot which isn’t imposed by my shadow. Or, maybe it really has been there since September 3rd. In an area so untouched, it would not be beyond reason. As I head back to the car I spot a painting of an eye on the side of the road, and see it as another photo taking opportunity. Upon closer inspection I notice that just behind it stands a wooden placard advertising a shop. ‘Crystals, incense, tarot’ etc. It’s obviously a very spiritual outlet, based in what looks like a 1980’s caravan, and it’s open every day of the week until 5pm. I decide to take a look inside. As I make my way along the path that leads to the shop I begin to sense a strange feeling, similar to the one I get just before entering a haunted house at the carnival. A handwritten note in the window at the entrance strictly forbids photography inside the shop. Eek. I step through the colourful bead curtain in the doorway and suddenly feel as though I’ve finally found that dungeon I used to assume gave Dungeness it’s name! Or something like that anyway. The space inside the shop is small and cramped, but every corner is covered with a variety of wacky and wonderful goods. As I look around at all the plaster-cast models of witches, smell the fragrances of a million incense sticks and feel the tickle of feathers from the dream-catchers above my head I begin to feel a little uneasy. There is nobody at the counter but behind a door I hear the sound of a couple of women laughing, or are they witches cackling? I half-expect to see the corpse of a witch behind the counter and am quite pleased that the counter-clerk isn’t there, with just the two of us in such a small building perhaps she’d want to make small talk. I’m not sure I could manage small-talk with a potential witch! Despite my somewhat naive unease, I love this shop. It’s interesting – I’ve only encountered a shop like this once before, and that was all the way out in rural Tennessee – a remote hut in the middle of the mountains. Here, you can almost see the spirituality dripping from the walls. Spirituality is something I’ve only really taken an interest in over the past year and a half or so. Before that, I would most likely have just dismissed the so-called healing qualities of incense, or empowerment of stones, as just being a load of false entertainment for nutjobs, nutjobs who probably believe they come from Atlantis and have the names and dwellings of fairies etched in their address books with a quill feather. Nowadays I’m much more open to the idea of the spiritual world. There is no proof that it doesn’t exist, and I’d like to believe that there is definitely the potential for a spiritual energy out there, enhancing our souls and channeling our energies into positive connections inside and out. I definitely feel that connection sometimes, and I’m intrigued to know more. I have two pounds in my purse and would quite like to buy something. Two pounds isn’t enough for most of the items in the shop, but I see a tray of brightly coloured gemstones, each of which possess certain qualities, or so the labels attached to each tray say. They are £1.10 each, within my budget, so I decide to buy one, and read each description to see which one would fit me the best. I eventually decide to purchase a green aventurine, a smooth, rounded quartz pebble in a shade of muddy green. It is a stone which is said to bring good fortune, clarity of mind and good adventures during travel. It is also supposed to dissolve negative thoughts and emotions, and bring about peace within. It is not the prettiest stone available, but it seems to possess the most appropriate of powers and so I decide to buy it. At the very least, even if it does nothing for me, it will be a souvenir of this strange little shack of a shop. By now, some other people have entered the shop and the noise of chatter has caused the shop owner to finally show her face. She has pale skin, jet black hair in a bob, and knows these people well. They discuss a previous purchase. I take my little stone to the counter and also decide to buy a ‘lucky Chinese coin’ for 40p. The counter-clerk gives me a wry smile. I hand over three 50ps. No change required. “Thanks Soph” she says after taking the money. I leave the shop and head back to the car. Something the counter-clerk said has made me feel slightly uneasy. I recall the dialogue again, in my head. One of my most favourite places to be is up in the air. Thirty-five thousand feet up to be precise. It’s not so much about the fact that if I’m on an aeroplane, then I must be on holiday – although that too creates the association between flights and fun. Actually, it’s more about the concept of being so high up, and the rare chance to be so much closer to the stars as I glide through the upper-regions of the troposphere with 150 strangers. Flight also provides us with that so mesmerizingly natural view of the planet below us; a view which can evoke memories of pages from all those Physics and Geography textbooks that we used to begrudgingly carry around in school and chuck back into our lockers as soon as class was finished. Aerial views of the jagged coastlines below us – defined at night by lamps which dot their glowing amber hues along the borders to contrast with the black masses of ocean next to them- bring all those world maps we’ve ever looked at to life. We remember that we live not just in houses, towns and countries, but Planet Earth – just one shiny bluey-green marble in an unfathomable, mysterious mass of infinite black space the total contents of which nobody has ever been able to say for certain. In any given second of commercial flight we are looking down on thousands of civilians, doing thousands of different things, in thousands of different circumstances. They may be living in homes which vary from the glamorous to the squalid, fulfilling acts from the most innocent to the most illicit, or experiencing events from the most joyful to the most tragic. Suddenly, my own circumstances, my successes and failures, highs and lows, seem less significant. With the humblest of meaning, my whole life seems less significant, because I am just one of 7 billion others who share the planet with me. The disappointment served by the frozen, inedible, sour tasting carrots in my in-flight meal turns from one of contempt and concern that I won’t have eaten enough on this long-haul flight, to just another of life’s little inconveniences that we ought just flick away with our forefinger into the depths of time and never dwell on again. One of the things I value the most about Challenge to Change – the charity I volunteer for which aims to help rural Asian communities adapt to the threats of climate change through sustainable methods, is that – like all international charities – it relies on nations working together to support one another, just like they should do. We also seek to inform people in the UK about the effects their CO2 emissions can have on homes on the other side of the world. Charities such as CtC are here to show that there is no place in society for ignorance towards other parts of the world anymore. Generally, international aid and environmentalist movements are just two of the wonderful ways in which modern day Earth is finally managing to interweave each fragment of it’s landmass, or each patch of it’s tapestry, together in recognition of the fact that all 7 billion of the globe’s inhabitants are united in at least one thing – their position in the Solar System. We are thankfully so far beyond the archaic days before global exploration, when one had no concept of a world beyond their backyard. Today, we live in an age where, the unfortunate obstacle of money aside, we can be on the other side of the world within the space of a few hours. Time Space Compression was the name that 20th century Geographer David Harvey gave to the idea of the world seeming smaller and smaller in size due to the emergence of innovative technologies like the internet and travel, and there aren’t many clearer demonstrations of this than the ability to send a message to the other side of the world in realtime, or being able to wake up in one continent and fall asleep in another. These are both things which we could not do prior to the 20th century. On the other hand, the world can still seem significantly larger if you were to compare the standards of living in somewhere like the tiny African nation Burundi with the most expensive, luxurious home in Beverly Hills. We are still years, possibly centuries away from being a planet in which the smallest of African states can boast the same economic status as the likes of the USA and the Middle East. Perhaps there will always be such divide, and perhaps it will always be the one thing that keeps us believing that the Earth is big when new ideas such as the aforementioned time space compression theory will try telling us that it isn’t. 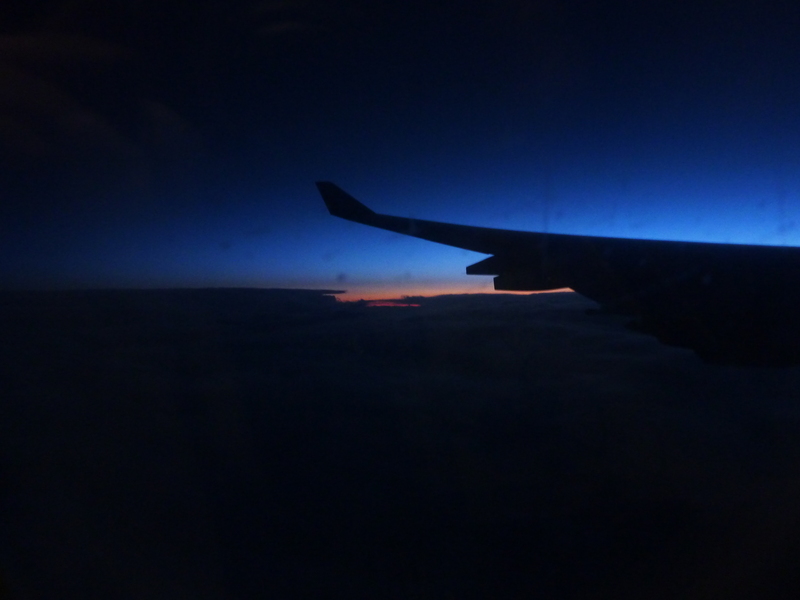 To me, the world is both big and small, and it is during flight, looking down on it all, that I realise this the most. When people proclaim that the Earth is a big place, I think about the internet and mainstream aviation and struggle to wholly concur. When others utter the phrase, “It’s a small world” (usually in reference to the sporadic meet of familiar faces in distant places) I consider the economic differences between East and West and struggle to wholly concur that as well. To try and weld our wonderful planet Earth into any kind of labels seems to take away it’s magic. It is what it is, but it may also be what it isn’t. And I like it that way. I love you, Miniature Tigers!